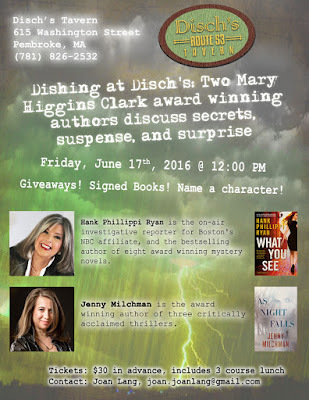 HANK PHILLIPPI RYAN: Want to have lunch with Jenny Milchman and me?Okay, you're invited. Really! See below for details, date and time--AND for some truly valuable insight. The Story Behind a Book Event or, Why Do Writers Do This Anyway? When you think about a book event, two scenarios are likely to come to mind. There’s the one where the writer arrives in a town car with her name in the rear window, gets whisked off to a lushly fitted out green room, only to be ushered onto a stage before a vast, applauding crowd. And then there’s the one where she sits at a folding table whose legs wobble, setting up stacks of her own books, and twiddling pens that feature the title of said book while customers come up and ask where the rest rooms are. What? The first one’s never happened to you? Me either. But I’ve had elements, so I keep hoping. And I basically refuse to do the second by this point. It’s too humiliating. I never know where those darn rest rooms are. Kidding. But not about the humiliation part. It all raises the question of why writers do book events in the first place. Do they accomplish anything for our sales? Our careers? Our humanity? 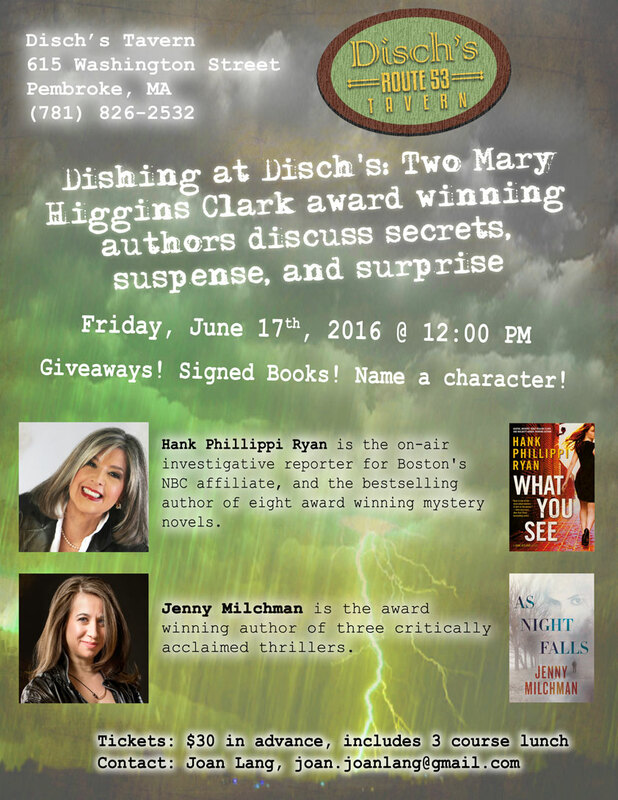 I want to dispel a few myths about book events. But first, you might wonder why I feel in a position to do so. Well, it took me thirteen rejection-studded years to get published, and after it finally happened, I did the next logical thing. Rented out our house, traded in two cars for an SUV that could handle Denver in February, pulled the kids out of first and third grades to “car-school” them in the back seat, and hit the road on a 7 month, 35,000 mile book tour. So, I’ve done an event or two in my time. One of the highlights was a talk with Red Wonder, Hank Phillippi Ryan, at the Cambridge Public Library. Watch this music video, and see if you can find the shot of Hank! She and I talked about books, and the industry, and how it may try to kill us, but in the end leaves us a whole lot stronger. Hey, we’re suspense writers. Death has to figure in somewhere. Myth 1: Book events are about selling books. Fact: Whether you sell two-hundred books or zero, you have met potential readers in a different, more meaningful way than happens on crowded online platforms. You’ve also encountered an influencer—the bookseller, librarian, or book club leader whose radar your work is now on. Myth 2: You should read at book events. Fact: Reading is the one thing I’ve heard over and over tends to bore attendees—and a bored attendee isn’t a good potential reader. Instead, teach something related to your book (a regional specialty, a craft, a foreign language, a lesson in CSI or genealogy—get creative). Discuss the fascinating road to getting published, or the more general accomplishment of achieving a dream. Hold a writing workshop if it fits the crowd. Tell your 10 Best & Worst moments as a writer. Make the whole event Q&A. Myth 3: A low turnout event is a dud. Fact: The great Louise Penny quipped, “The only thing worse than an event where no one shows up is one where one person comes.” And indeed it can feel awkward to perform a talk for an audience of one. So my answer is—don’t perform. Just…chat. Really connect to that person. Who knows who she knows, and besides, you may make a friend. At some of my sparsely attended events, one of the few people in the crowd was, respectively, a book reviewer for a major newspaper, a book club leader, and the president of the Friends of the Library Association. SO: Let's do lunch! Seriously. This year, as part of my third “world’s longest book tour”, Hank and I get to meet again at a luncheon event hosted by former bookseller Joan Lang. The date is June 17th, the time is noon. In Pembroke Mass. Have a look at the poster for the event, complete with contact info so you can join us. Hank and I would love to see Reds readers in the crowd! In this life of events, I know it’s going to be another high point. 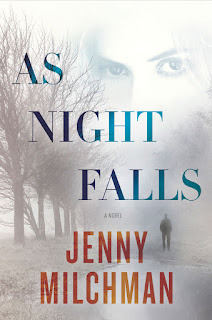 Jenny Milchman is the author of Cover of Snow, Ruin Falls, & As Night Falls, and the creator of really long book tours. HANK: SO? Can you come to lunch? CLICK HERE! We're cooking up all kinds of prizes and surprises--including mentoring, query advice, personal chapter critiques and of course, free books! And how do you feel about book tour? Considering the amount of effort writers put into a book tour, they certainly deserve meeting rooms filled with enthusiastic fans. For readers, there’s something very special about having an opportunity to meet the author of the books you love to read. 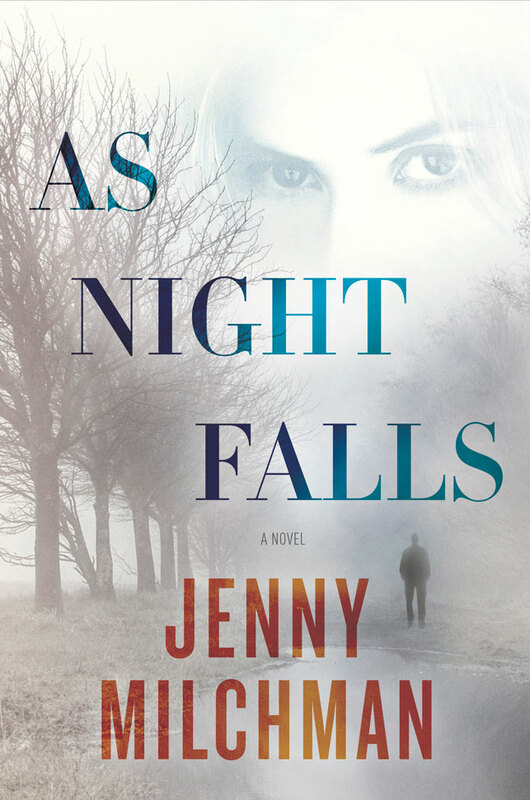 Jenny, I’ve enjoyed reading your books and am looking forward to reading “As Night Falls” . . . .
Jenny, and our dear Hank, it helps to be incurable optimists, too! Lunch sounds amazing with you both. Wish I could join you. Have fun, Jenny! 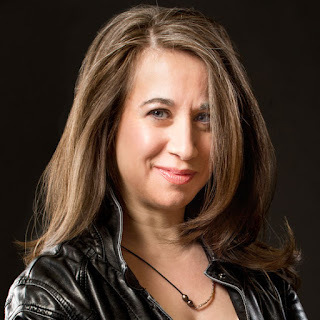 Hope to see you at Bouchercon! When I find an author I really like, you know, the one you read and then go on a search and discover to find every single thing she's ever written and buy them all, I want to know everything about this person, feeling as if I've made a new friend. So if I am so fortunate as to be able to meet someone during a tour, I am ecstatic. My first experience was many years ago, scored a ticket to a Junior League affair in Long Beach CA. There were three authors, one I can't remember, but the other two were Barbara Kingsolver and Sue Grafton. THE BEAN TREES and A IS FOR ALIBI had both just been published I think. I thought to myself, holy crap, these two will go far. When Louise Penny was two or three books into the Gamache series, she did a CBC radio show with call in. No one was calling. So I did. It was like she said, when only one person shows up, chat. We talked for a good while, and she asked more questions than I did. Talk about a way to make a loyal friend and reader! Being at LCC last winter was incredible, catching so many of my faves all in one place, left me star struck. I was so impressed at how you do it, remember names and faces, take time for some personal conversation, be so genuine, sign books for hours and then be prepared to facilitate a panel. I met far too few, but if any of you are ever within driving distance, I will be there, the platinum blonde in the front row. Think Catriona McPherson, only twice as old and sans funny accent. And I will buy your bewk. Yes congrats Jenny on another book and as Karen so rightly puts it, your incurable optimism. I would love to do lunch, but a) it's a Friday and I'll be working the day job and b) I'm in Pittsburgh. But hopefully I'll see (both) of you at Bouchercon! I love book tours because I like meeting authors and chatting. Oh ANn-that is do reassuring! Did you see the photos from Louise's book tour? HUNDREDS of people, standing room only, ticketed.. All fab. It's so difficult to predict--a bookseller pal also told me about it from the other point of view--publishers have bookstores compete for authors by choosing appearance venues based on which promises the most sales! And our far flung reds-- jenny and I wish you all could be there. You are a brave woman, Jenny, to haul your kids (and husband?) around the country in a car. I have been to a few author appearances at Murder by the Book. Just a few. Parking is an issue. Crowds can be an issue. Best solution has been to have my husband drop me off, send him across the street to the bar/pub, and join him later. That said, they're enjoyable. Wish I could "do" lunch with you guys! Oh, Pat Jenny's story is AMAZING. Amazing! I am in awe--and her family is incredibly supportive! Hey Jenny! Nice to see you here--and so glad you're doing another world's longest tour! Oh, thank you Lisa and MAry…yeah, that would be so great..sigh. Someday. I agree one hundred per cent with Jenny's points about book tours. The part she didn't enumerate - but you can read between the lines - is how great it can be to meet up with sister authors when your tour brings you to town! When Jenny hit Portland, ME, we got together at the bookstore and then went out with husbands, kids and friends, to a great local eatery. It was a wonderful time, and a chance to connect with another practitioner of this peculiar profession. Jenny-I loved seeing your book tour on You Tube. And I DID see Hank in there! What a fantastic way to commemorate it!! Congratulations on having such a supportive family. I love your books. Met you in Albany. Wish I could be there for this lunch. Maybe catch up with you both at Bouchercon? Oh, I'm so happy and grateful that authors do book tours! Bouchercon is my favorite place to meet with favorite authors and talk and eat and drink and soak in the atmosphere of books, but the bookshop stops are wonderfully intimate. Unfortunately, I live in an area that isn't blessed with many author stops, and the past couple of years have not been conducive to me traveling to sites. However, I hope to in the next year start picking out some smaller venue appearances and attending. What a treat it would be to attend the lunch with you, Jenny, and you, Hank. Guess I'll have to wait until New Orleans to see you both. Yes Debi and Kathy! See you in New Orleans! Ann says it perfectly. Love, love, love book tours...would love love love to be able to attend more. And as a person who has always loved, loved loved to be read to -- I'd be the gray haired woman holding my breath throughout a reading...not bored, not inattentive, mesmerized! Thank you all for all the work you do. Thank you, Reds, for having me back to the world's greatest blog, Hank, for letting the two of us do lunch, and everybody, for these great comments! I appreciate the kind words about my books, Joan; Ann, certainly hope to see you at a book event one of these years--SRO or you're the only attendee--either will be great! Karen, I wish you could come too--and Mary, sigh. Will just have to see you at MLB next time? Lucy/Roberta, the kids thought this was the greatest thing in the world the first two years (ages 7 and 9, 8 and 10). Then my daughter turned 12 on the third tour and was like, "You mean I have to leave my friends?" This year my son is all soccer all the time, and all I can say is--I'm glad we're not juggling a full 2016 tour (this event is for my 2015 release). However...some of our most special family moments have been in that car. I dearly can't wait for the next one. Pat, MBTB is one of my favorites! I hope to meet you there some time. Lisa, great to see you, let's catch up in OR this summer? And Storyteller, hope we get to meet one day. Debi, so great to have that reminder of the fun time in Albany. Hopefully again before too long! Thank you for your kind words about the books. Kathy, I do wish you could come, and Elisabeth, the thanks are all to YOU and readers like you. I couldn't tell my stories without you. And wait! I was saving this note for last--because the event Julia mentioned still counts as a highlight amongst highlights. Getting to meet some of my favorite authors, people who inspired me, whose work inspired me during my loooong years of rejection made all of that worth it. Well, I could've done with a few fewer years of rejection. Or maybe not. Maybe I needed every one. Either way, that trip to Maine--a book event with Julia and Charles Salzberg at Longfellows--put together by emerging writer Brynne Betz--and a dessert party after--well, as the ads say, priceless.